Some people consider me high-maintenance when it comes to what I eat, but there is a reason behind it. Living with a life threatening food allergy is rough.SO I make the most of it and and enjoy food that is safe for me in it's finest forms. A few years back, after a close call with Anaphylaxis, I was diagnosed with a deathly allergy to MSG. 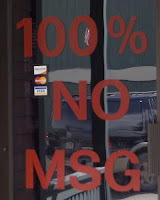 MSG and/or Monosodium Glutamate is a food additive that has no positive benefits in our food. It exists simply to allow food manufacturers to use cheaper ingredients of little or no nutritional value. In the 1970's scientists demonstrated that at least 25% of the population react to monosodium glutamate. Today those reactions are recognized from mild and transitory to debilitating and life threatening. MSG-sensitive consumers react to free glutamic acid (or free glutamate) that occurs in food as a consequence of a manufacturing process or fermentation -- regardless of the name of the ingredient that contains the processed free glutamic acid (MSG). The Food and Drug Administration has even acknowledged that consumers refer to all free glutamic acid as MSG. 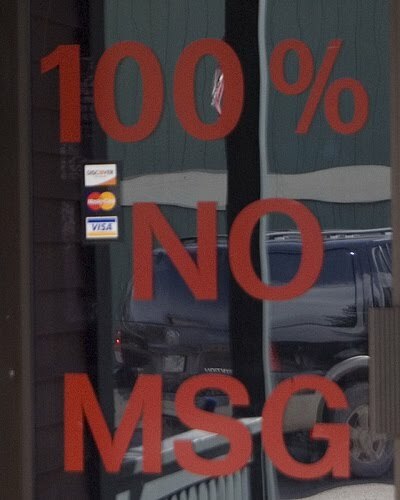 Yet, consumers who choose to avoid MSG have great difficulty doing so, because more than 40 different food additives contain MSG without disclosure. There are three neurotoxic amino acids commonly used as food additives: glutamic acid, aspartic acid, and L-cysteine. Free glutamic acid ingested as MSG can cross the placenta during pregnancy, can cross the blood brain barrier in an unregulated manner during development, and can pass through the five circumventricular organs, which are "leaky" at best, at any stage of life. In addition, the blood brain barrier can be compromised by such things as drugs, seizures, stroke, trauma to the head, hypoglycemia, hypertension, extreme physical stress, high fever, and the normal process of aging. It is generally accepted that the young are particularly at risk from ingestion of MSG. MSG-sensitivity and allergies are difficult to diagnose because the reaction is not IgE mediated; because individual tolerance levels vary; and because MSG reactions may occur anywhere from immediately to 48 hours following ingestion. The key to diagnosis lies in the fact that an individual typically responds to MSG with the same reaction(s), and after the same elapsed time each time that MSG ingestion exceeds the individual's tolerance level. MSG is contained in just about every fast food on the market - Ever think about why your McDonalds fries taste so good? A small kids fry contains 28 grams of the addictive additive. So call me high-maintenance all you'd like, and keep on downing your death fries. I like my high maintenance foodie ways, I also like breathing and not having to inject myself and make the trips in ambulances to the ER. I sympathize with your allergy to MSG. I have what is generally referred to as "food intolerance" for soy and most legumes, plus a mild allergy to walnuts (the skin in my mouth blisters and peels off if I eat food that contains walnuts). Plus, I haven't eaten red meat for over 20 years. I don't have to worry about going into anaphylactic shock, but I do get labeled as a picky eater - just because I frequently ask about the ingredients and ask for substitutions.